In the overview section of the Diablo 3 Monk Leveling Guide we will explore the unique attributes of the new monk class and learn about the traits that set the monk apart from other melee classes in Diablo 3. Later in the monk guide, we will cover more specific abilities, along with tips to power level monks quickly and easily! The monk is know for his or her mastery of both mind and body. Only after many years of training in the spiritual and martial arts does a monk leave the monastery and enter into battle to rid the land of evil. A master of unarmed combat as well as melee weaponry, the monk dispatches of his enemies with lightning-fast strikes and lethal weapon blows. They are capable of inflicting enormous damage on single targets as well as a handful of AOE (area of effect) attacks to multiple enemies using their elemental power. Their single target damage will make monks a valuable group member when fighting bosses and more difficult rare mobs. Monks are extremely nimble, opting to quickly move around the battlefield while engaging their enemies, rather than slower, more heavily-armored classes such as the barbarian who may opt to engage is a relatively stationary slugfest. However, when forced with dealing with dangerous and overwhelming situations, the monk has many evasive and defensive skills to avoid incoming damage. The monk has access to a vast array of martial abilities, which are amplified in their power and efficiency when used in quick succession. Certainly, the monk’s predisposition to make use of the combo experience bonuses available in Diablo 3 will be of great benefit to fast monk leveling throughout the game. 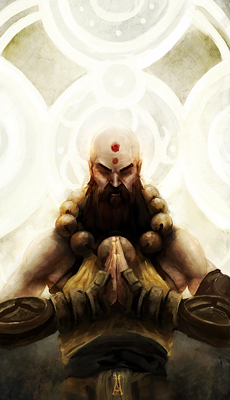 Spirit is the monk’s main resource and is generated from deep within the monk himself. It is said to be the product of years of focused training and spiritual discipline. Like the resources of other classes, spirit is generated and spent depending on which abilities are used. Landing multiple spirit-generating attacks in a row will fill the monk with his/her spirit power which can then be expended through devastating attacks and finishing abilities on multiple targets or even life-saving evasive maneuvers. There is no cool-down on spirit-using abilities, though when it’s gone it will quite slowly on its own. To regain spirit quickly, you will need to land several spirit-generating abilities in order to refill your meter. By carefully planning sequences of attacks, you can develop a rotation of abilities that will constantly be draining and refilling your spirit, allowing for an essentially endless barrage of deadly attacks. 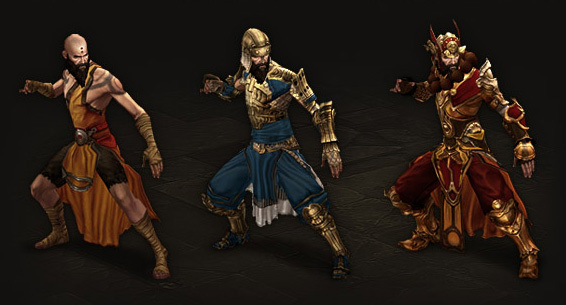 Although the monk is famous for his use of deadly kicks and punches, he also has a powerful arsenal of Diablo 3 weapons to incorporate into his combat. The monk’s class-specific weapons include fist weapons such as the katar and also the daibo, more commonly known as a “bo”, or staff. The monk katar and daibo will undoubtedly give a great deal of unique character to their fighting style, particularly when paired with a flurry of combo attacks. Additionally, the monk is able to wield a range of other weapons, including one-handed axes, daggers, one-handed maces, one-handed swords, and spears. The monk may also wield the two-handed polearm and the common staff. Monk armor progression starts with relatively weak cloth robes. After a bit a leveling, the monk will have access to more substantial personal protection with robes adorned with hardened metal plating and fearsome ornamentation – all designed to allow the fluid movement required by the monk’s specific fighting style. Monk mantras are basically party-wide buffs that become available at level 2. Mantras cost 25 spirit to cast and only one mantra can be active at a time. The mantras offer bonuses that include increase dodge, reflective damage, increased life generation, and increased damage to enemies. All monk mantras can be significantly enhanced and modified through the use of runestones, allowing for a huge variety of potential party bonuses. For example, the Mantra of Evasion gained at level 2 can be modified using the Golden Runestone to offer an additional bonus of a 7% increase in movement speed for the entire party. This is an excellent way to directly and decisively increase leveling speed in Diablo 3 by allowing you and your party to tear through enemies even faster. The Diablo 3 Monk Leveling Guide will continue in part two with an in-depth discussion and analysis of the monk active skills and my suggestions for monk attack rotations to allow for efficient, non-stop monk power leveling in Diablo 3! Wow…I am a longtime addict of the barbarian/warrior classes in any game where given the option. I was a barbarian first in Diablo 2 and a warrior first in WoW. But, this intro to the monk has me seriously reconsidering! It seems like an awesome hybrid of Diablo 2′s assassin, paladin, and barbarian. Bring on the monks! Thank you for the insightful feedback. I’m sure all of the gamers who enjoy playing the monk class will appreciate your input. Next post: No Diablo 3 Mods Allowed…Big Deal Or No Problem?